Right off the road, just past the barrels, is a big brown warehouse up on a hill looking over a townhouse-style strip that almost mirrors the shape of the lake, the vineyards, and of course, the lake. While you’ll want to hit up the warehouse first—that’s where the wine tastings are—head straight to reception, as they’ll give you vouchers for free tastings upon check-in. Both buildings follow a forest theme, with brown bases and green roofs. The tip of the strip houses reception, and the rest of it is the small two-floor inn. In the lobby, you’ll be drawn to the scented candles for sale or the big brown leather armchairs, but pay attention to the person checking you in, as they’ll be revealing details about free tastings and the free bottle of wine in your room. The long hallway with sunlight streaming through the windows and modern lanterns hanging above will lead you to that free bottle. The owners added the inn years after opening the winery, probably because people needed a place closeby to crash after sipping wine samples all day. The rooms are what you’d expect, with rustic wooden furniture and vineyard-themed art on the walls. The décor is sensibly minimal since nothing can compete with the view you’re about to see; every room has a balcony or patio looking out on the vineyards and lake, the perfect place to enjoy that bottle of Glenora’s Syrah or Cayuga White. Larger rooms come with a fireplace and Jacuzzi tub, but you won’t be in the room much—wine tastings await. Many would say that the spacious wine-tasting room is Glenora’s shining star, what with floor to ceiling views of the property, knowledgeable staff, cute tchotchkes for sale, and, of course, wine. And they wouldn’t be wrong. But I expected that; Glenora has been making a name for its wine since 1976. What I didn’t expect was a culinary experience that would make most other meals seem like dog food. First, the setting is spectacular; Veraisons’ large dining room has a high ceiling with wooden beams jutting across, a stone fireplace, and a wall of windows that leads to a wraparound terrace looking out on the lake. The lanterns hanging above each table resemble small buildings, or Dr. Who TARDIS’, giving Veraisons a bit of quirky character. These little lanterns shine light on a meal that will change the way you view food. If you’ve got lots of food restrictions, like me, the menu—creatively concocted by executive chef Orlando Rodriguez and sous chef Sarah Hassler—will make your heart skip a beat. Actually, it will make anyone’s heart skip a beat, but some will be skipping in fear. What on earth is vegan bangers and mash? Not really sure, all that matters is that it melts in your mouth. Dishes like tacos filled with coconut breaded cauliflower, lime aioli, and slaw (pictured above); and a vegan eggplant burger with spinach and artichoke spread, crispy shallots and Dijon horseradish aioli on a rosemary focaccia bun, can convert any meat-eater. But those reluctant will find solace in dishes like house chili made with pork served with feta-filled arepas or peach glazed duck breast with edamame mousse, radish, sweet potato duet and duck jam. Veraisons has achieved the seemingly unachievable; a menu full of vegan or gluten free food that isn’t bland, raw, or particularly healthy, but indulgent, rich and flavorful (like their peanut butter blondie with peanut butter fudge, chocolate soil, peanut butter ice cream, ricemallow crème and hot fudge). All it takes is a staff dedicated to changing the food industry, as Veraisons’ is. So dedicated, in fact, that they’ll bring you new creations to taste—complimentary—throughout the meal, from new cocktails to improvised dishes. And if you want something that isn’t on the menu, just ask. They can pretty much whip up anything. It’s like they work out of a magic kitchen. If you’re coming for wine, there’s no need to leave the property. 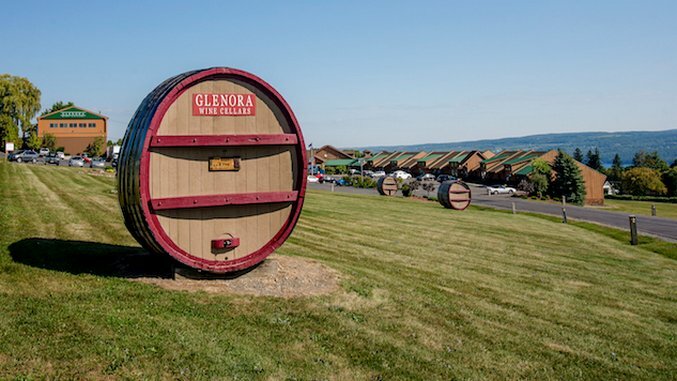 But if you insist, Glenora offers free tastings at some other wineries in the area. If you’re into beer, cross over to the other side of the lake for inventive breweries. Watkins Glen is at the southern tip of the lake, a five-minute drive from the inn, if you’re looking for some nightlife or shopping.